I'm trying to do better with the picture thing. What I really need is someone to follow me around and take my picture all the time (I cant think of anything worse). Its hard to take pictures of myself. I got to my office so early this morning compared to the normal time I get here. I had a great nights sleep, no Target last night and no sleeping in the desk chair, and woke up at 8am to a business call. I love those mornings!!! So I'm at the office by 9 getting all my stuff together, blogging a little bit and I have come up with a new ab workout that I think you will love. This is how it works. Put your feet up...this part is really important, next to your phone. Now surf the web, do all the stuff you must do while sitting at your desk, but all with your feet up. Now when the phone rings or you have to make a call, which is what I have been doing all morning, you have to reach the phone. This engages all the muscles in your midsection and also provides a nice hamstring stretch in the process. 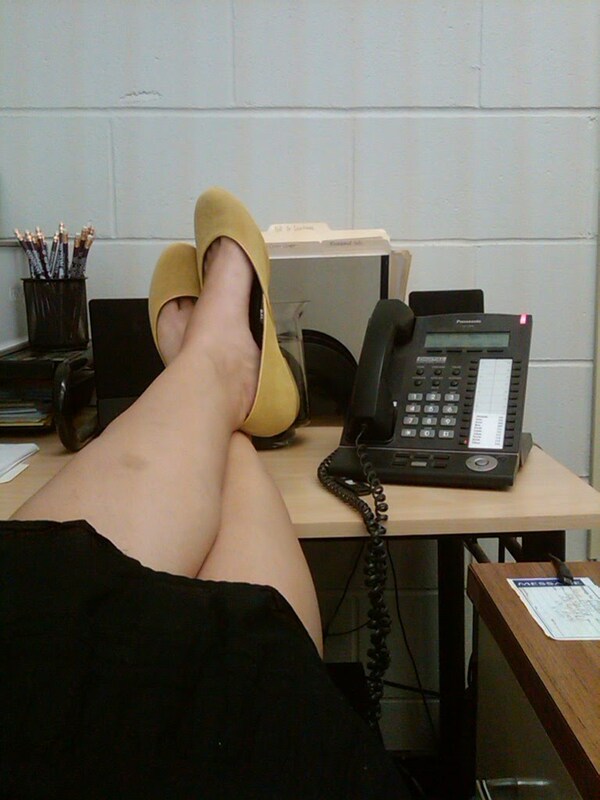 And every time someone comes into my office I have to pull my feet down really quick, that has to work something too. Leave it to FatGirl to come up with a workout that requires you to sit with your feet up!!! I LOVE IT!